We may be born with the ability to hear, but the ability to listen is not innate. Listening skills can be strengthened by music. By exploring a variety of instruments, for example, children hear, see, and experience a variety of sounds – scratchy sounds, booming drum sounds, ringing sounds, trickling sounds, and more. As children experience the variety of sounds they can make with musical instruments and everyday objects, they are developing the listening vocabulary necessary for sound discrimination preceding language. Phonological awareness is the ability to hear sounds that make up words in spoken language. Through phonological awareness, children learn to associate sounds with symbols and create links to word recognition and decoding skills necessary for reading. Where spoken language is comprised of a stream of connected phonemes (individual speech sounds), music is made up of a series of discrete musical notes, or tones. Understanding a spoken sentence requires successful auditory processing of individual phonemes, and hearing music requires listening for the individual notes combined with their rhythmic values. Because of these similarities, the human brain processes music and language in some similar ways. Most children become aware of print long before they start school. They see print on signs and billboards, in storybooks, magazines, and newspapers. A child’s introduction to patterned text often first occurs in songs, chants, and rhymes that are repeated over and over again. Once children become familiar with this patterning, they are excited and able to participate in shared reading, writing, and other oral language experiences. Concepts about print become more meaningful, and conventions of print are learned in context. Additionally, substitutions in songs, chants or poems can provide for real language experience opportunities. When emergent readers see printed words in the text again and again, they come to identify those words and phrases by their similarities and configurations. The ability to recognize differences in phonemes (auditory discrimination), and the ability to remember or reconstruct the order of items in a list or the order of sounds in a word or syllable (auditory sequencing) are necessary for learning to read. As children experience and listen for tempo (fast or slow), dynamics (loud or soft), and melodies (up or down, high or low), they are developing the critical skill of being able to distinguish between sounds – an ability that is essential to reading. Songs and music activities often require children to remember both the detail and order of what is heard and to respond accordingly, thereby increasing the brain’s ability to organize and make sense of sound – a skill that is also required for literacy. During the preschool years before children can read, children rely exclusively on the oral language they listen to in order to acquire language. 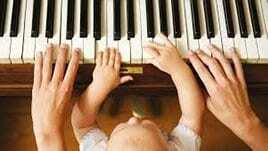 When learning songs that they recite over and over, the words in those songs become the building blocks of their vocabulary. Join us at George's Sing along! Click below for details! Do you know about phonemic awareness and why it’s important? Copyright © 2019 Georgetown Hill Early School. All Rights Reserved.